Transcription Dated April 15, 2013. We are Happy, happy to be with you once again, oh! This evening is a very, very beautiful; it’s an exciting time for each of us we know that the challenges that you are feeling upon the Earth. Let us now in this moment within this beautiful Temple just bring forth the beauty of this moment in gathering together in Oneness. We are the Angels of the Cherubim, the Seraphim, Ophanium, and the Elohim. So just breathe and feel your Angel wings, as you are here for a very particular reason. We thank you for stepping onto this world of Oneness. I AM the Cosmic Great Central Sun of the Divine Mother and the Divine Father God as One Being. It is our pleasure to be here with you once again. How could we not be with you when you are feeling so many challenges and energies going on upon the world especially today. Oh, there is much upheaval happening? Oh! Do you know why? Do you know why? Forces of the other side that have been holding onto the matrix are not so happy, not so happy as they see people starting to change. So things are happening right now. We are not really going to discuss any details of that because that is not our role. We want to give as much beauty and love that we can to you so that we can feel the Oneness as your heart expands. We feel this, we feel you coming into Unity of your own Self and the Inity in the world around you. The hardest part is to understand the world around us, which is a challenge. All that we can do is remember where we were previously and allow those energies to enfold within you and say, “I thank God, Divine Mother and the Divine Father God that have assisted me so much to realize that I am no longer in that space.” And it does take steps to get into this continually space of Oneness but this is the place to be within this beautiful Temple of Light. We have wanted to share the updated information as changes are occurring rapidly as you are experiencing upon the Earth. So it is very important that each of you hold your ground with your own thought process and the energies that are happening within you to assist this planet; this is what you are here for; this is your awakening process this is allowing you to come into full creation of your own Self and what a beautiful Self each of you are. We are so excited to be able to expand our energies unto you this evening because we are moving towards the Lunar Eclipse. This is the first of seeing more of these events occurring which will create changes within the world. The elements of awakening is not easy and those that do not want to accept are going to be infiltrated with more darkness within their Being. It is not because of their own way of existence; it just because all these other forms of energy want to hold down as many as they can. So we need to help each of you arise; arise so that you can be the ones that are allowing the Light to be stronger then the dark so that these elements of individual experiences do not take hold of your being. We want to prepare you for the amazing Wesak events. We are very, very excited to be here with you at this time to be able to communicate to you in this movement that is occurring upon the Earth. It is quite a movement as many planetary structures are looking at the Earth and the changes that you are going through. They are seeing the awakening of so many individuals, so many star seeds, and so many wonderful people whho are fully allowing to see themselves differently then they ever have before. This evening what we want to do is to prepare you for the energies that you are going to be experiencing from our beautiful guest. What are those experiences going to be? We are going to let him discuss what he wants to talk about and what is it that each of you desire now. This is a perfect time because this day the world is in a lot of duality, which represents a structural change occurring within the Earth’s atmosphere as individuals move and separate from parts of themselves. The duality that is existing can no longer take a hold of you if you don’t allow it to be. So it’s important that we assist you to through this process, because there maybe a few other changes that are going to be happening within the planet in the next week or so. You must allow your thought processes to be of your Higher Self, to be of your I AM Presence. We want elevate you this evening. We want to assist you with a whole new experience because as you travel through the changes while walking through your own initiations of being a planetary master moving into cosmic awareness, it creates such a shift within your physical essences and consciousness. We want to help you arise from any other thoughts that may be trying to interfere with this totality of accepting a higher sense of your Being. We are going to share an essence with you in the next few moments. Take a deep breath and allow the essences that you no longer want. What is it that you have experienced in the last few days or maybe today or what you are experiencing now? As you are thinking about what has happened in the world today? Let’s remove those, lets remove your thoughts from those experiences because you will start to understand what is exactly occurring for you if you allow your Higher Self to be the guiding rule. Physically, we know all of you are tapping into that essence but it depends where you are in your structural changes that it is occurring for you. This is the reason we want to be fully aware of the Oneness which needs to occur in the physical body. We do not want this to occur by just wishing it to be so, not just saying prayers for others, but allowing those essences to be in you as you need prayers also. You are not in a destructive place in this moment; you may be emotionally and mentally but not physically. We are all safe in this moment so take that as a deep moment of gratitude. Breathe in deeply allow this essence to elevate you feeling the energies within your Root chakra. Let’s go into the Root Chakra and we want to bring in the Crystalline Light the Ray of Balance and Harmony to filter anything that is stuck in that Root area. We have a tendency to hold onto those energies, and this is our grounding force upon the Earth. It is also one that can hold us back from not allowing the higher frequency to be within. Harmony and Beauty, Harmony and Beauty. I want you to breathe in that Crystalline Light; allow it to go into your Root and fill it up through your entire Chakra system. Feel it arising from your Root. Now let it reach your Heart; your Heart is full of Compassion and Love. Take the Harmony and Balance of the Crystalline and blend it with the the Green of your Heart Chakra and the Deep Pink of the Creative Activation of compassion. The divine love is coming fully within your Being. Feel them meshing together and taking it all the way up to your Crown and taking away any elements from parts of your body allowing your whole essence to be your physical essence and embodied with the Crystalline Pink. Breathe the energy down to your Root so that everything that was not in alignment a few moments ago now feels complete with the sigh. Now feel the Pink Ray of Love just blending through you almost like you feel like curling up into a little ball and taking a little nap. Just embrace the Love, embrace the Balance and the Harmony within your entire being. We are now going to do something a little different this evening that we have not done with us due to what is occurring upon the Earth. We are now going to send this energy outwards. We are not going to wait until later but we want to do it now. We want Gaia, we want all the individuals that have been hurt, we want everyone that is going through a huge moment of transition within them to fully embrace this essence of the Crystalline and the Pink. Let’s just breathe as we feel everyone in the Temple breathing together. We are one nucleus of breath and expression of Pink Harmony. Oh feel the Crystalline Light as everyone in the Temple expands themselves through the Multi-Universal level into the Universal level into the Galactic level, into the Solar level, and within the Earth. Just breathe, breathe this essence. With your breath, you breathe it out the Crystalline-Pink-Green essence like seeing a Deva of the Wind, and allow it to go to everyone around the globe. 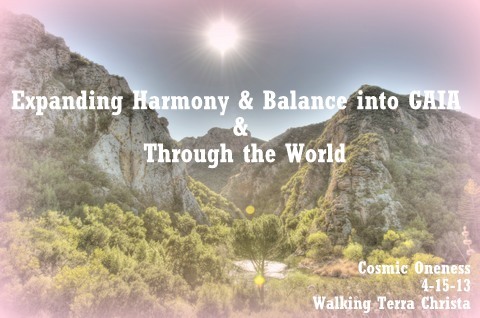 Center upon all that is going on in the world right now as we take this moment of rejuvenation of the Harmony and the creation of Love to encircle Gaia. It encircles all her inhabitants and to all the tragedies that have been occurring around the world. There is now a breath of calmness within the frequency. Now feel Gaia as she is receiving this essence that she has found. She is holding it deeply upon the Earth. She thanks us now as we bring that energy back into us. Feeling ourselves back into the Temple once again. It is our Divine pleasure of the Divine Mother and Father God to be One with each of you in this moment. Many blessings, the Light of the Christed One is lit in the entire structure of Planet Earth and you are holding that Light along with the devas on this day. We thank you. ©2013 Walking Terra Christa, http://walkingterrachrista.com, Rev. Christine Meleriessee & Mike Hayden, 5th Dimensional Mastery ~ All Rights Reserved. No use without prior written permission allowed except for sharing the post in its entirety along with the link to this page, Cosmic Oneness-4-15-13. We are the Angels. We are with you ~ OH so deeply within your Heart, feel the beauty that You Are, feel the glory, feel the light as it enfolds within you ~ OHM. It is our Divine Pleasure to be here with you in this moment to share the Angelic Light to see the reflection that each of you are experiencing as it illuminates unto us. We send it back to you in this moment. Just take this moment to reflect and to feel the essence that we see within you as now we open up the energies as Divine Mother and the Divine Father God of the Cosmic Great Central Sun to share their essence in this beautiful Temple of Light. Namaste. We are the Cosmic Great Central Sun of the Divine Mother and the Divine Father God. Breathe in the essences that have been imparted unto you from the Angelic sources which is your illumination unto this Temple of Light. Breathe in deeply ~ oh, the reflection that we see in this moment is so amazingly beautiful. We do not even have the human words that we can express the luminosity, the reflection, the deepness and the brightness that we are feeling from each of you in this moment. So take a breath and allow our essence to shine upon you, because it truly is your own essence that you’re receiving in this moment. It is a great glorious week; because each of you has come into a space of conditioning within yourselves. The challenges that you have been receiving of the previous months of this year have truly assisted you greatly as we look at each of you. The sparkles of Light that we see within you are emanating to each of us to allow our message to become even more starlit and vibrant. As we look upon this Temple at this moment and look up upon the stars, this is what we see in each of you, your own star essence is illuminating unto this glorious Temple of Light. We say to each of you, the souls that have transitioned very recently that are very unsure of what they are receiving in this moment as this is the total truth of Light upon this planet. It is now time for you to receive this reflection as you watch the Ones that are visiting in their Light bodies and are transitioning to a better part of themselves. You are assisting them in doing so; everyone here is assisting each other through this process of connecting in our frequencies to see that there is a greater part of themselves that they may need to be acknowledged. It could be from another Being from this Temple or it could be from the Light formations that you see sparkling downwards into the Temple in this day and in this moment. It does not matter where you need to receive it as it is the most important element is to receive. This is what we ask of you in this moment as we move into this week after the blessings of the resurrection, the essences of this holiday of Christianity. This is just not the holiday for Christianity, but it represents each of your resurrections that are taking place at this time. There is a deeper knowledge that is going on within each of you within these moments for you to accept a deeper part of yourself that you did not recognize. Because, as you receive more inflections of Light into your totality, into your three Minds of the lower body system, it will grow like a seed which will flower in a multitude of Oneness to assist you in accepting all parts of yourself into the reality that you are experiencing in this moment. It is a beautiful moment in time, because this is the strongest phase that initiates will experience whether being in a physical body or Being in your Soul’s Essence as we are coming upon the great festivals of Resurrection of the Christ, of Wesak, and Humanity. This month you will go deeper into your Core of your Being as an initiate. So it is a time for you to totally reflect in your pathway and what you are doing for yourself in the process of Mastery and how to incorporate more of the miracles, how to incorporate more of the ability to create and to flourish as you allow the manifestations to occur within your world. This also reflects in the way that you give service because all these elements represent how you are receiving it back. You cannot just sit there as an initiate and say, “Well, I need this, I need that, please Archangel Michael will you help me with this, please Master Kuthumi, please St Germain or Lord Adama bring to me the ability to do this.” It represents the Universal Law and understanding the balance of All That Is. This is exactly what you are going to be experiencing in the next upcoming days until the next Full Moon. We share this now to help you assimilate what you are experiencing on a day-by-day basis. Take note of what is coming up for you allowing yourself to understand your dreams in a very esoteric manner which is not so much of the reality of your third dimensional mind. Allow the essences to flow within you, allow them to come within you and move through you so that you accept what is necessary and dissipate what is not. It is going to be your goal at this time to be the standing energy to allow the wind to come in and make the changes necessary that allows the sun to flourish within you as you stand in the power of your Light. Why should we wait for the very end to asist you to become more balanced, to feel the essence of your totality, to allow yourself to accept your pathway at a much deeper level then what it is now. Let us go to the depths; let us bring those that you need into your life to assist you and to be your friends, your colleagues, your clients, let us flourish because we are going through the period of regeneration of this spring allowing these essences to fully come within you. So we take this moment now to reflect this essence unto you of your ability to regenerate all that you have been experiencing. We know that the Spring Equinox you created many changes for many of you. Now its important for you to understand what you need to do with these changes so that you can go into a deeper level then what you did previously. Removing the layers upon layers will assist you to start to find the core being that you are that you have accelerated within you. So take a moment with your breath and accept this frequency of Light. You may use the chant of AH for you to receive more in your physical existence. Feel the regeneration occurring within your physical essence of the Divine Completion coming into full focus; allow it to filter in your cellular structure, allow it to come into all areas to regenerate yourself into whom you are. It may seem a little unfamiliar because you have not done this previously. Now just allow the energy to settle totally within you; allow it move through your essence as you feel yourself being regenerated. Allow the sprouts of the new to be opened through your Root chakra to regenerate parts of yourself that need the highest capacity of Light and not just your upper being as it moves through all aspects of your physical creation. We, of the Divine Mother and the Divine Father God, are so very happy to be with you and to be at this crucial point of transformation. We thank you deeply for allowing your consciousness to be our consciousness. I AM the Divine Mother and the Divine Father God of the Cosmic Central Sun embracing you. We embrace you with all that We Are and All That We Always Have Been. So Mote It Be In The Light That We Always Are In Oneness. ©2013 Walking Terra Christa, http://walkingterrachrista.com, Rev. 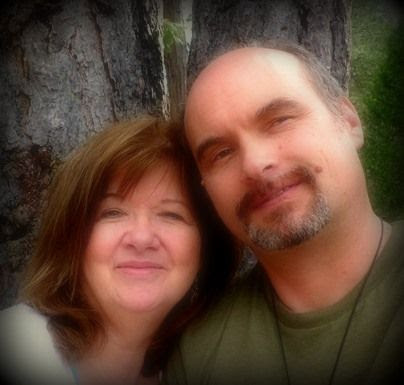 Christine Meleriessee & Mike Hayden, 5th Dimensional Mastery ~ All Rights Reserved. 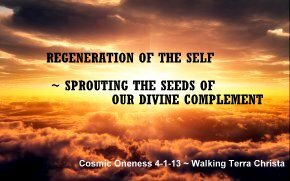 No use without prior written permission allowed except for sharing the post in its entirety along with the link to this page; https://cosmic22oness.com/2013/04/08/regeneration/.